Food safety regulations and production standards are passed based on intensive lobby powers by those who control the current food chain. GMO crops, pestizides, fertilizers, drugs and hormons are all part of the corporate controlled food chain. Food safety measures for industrial food production have become the death knell for most small farms, small butcher shops, small dairies, small bakeries. Most of the traditional rural infrastructure as we know from history has been destroyed as a result. The centralisation of our food system is currently the greatest danger to the food security of our nation. Governments have forgotten their mandate to protect our individual freedom, our individual rights and disregards at the same time our ability to act responsible and thoughtful. I have been watching and experiencing with great pain the growing corruption and irresponsibility within bureaucracy. Equally disturbing is the lack of courage by elected officials to challenge the same. The demand from many people for quality and locally produced food as result of these dramatic changes is violently opposed by bureaucratic regulators and Goverment. Under the pretence of protection it becomes clear that Government has taken a dictatorial approach in order to protect us from ourselves. It appears that even the courts are more and more compromising their role in society as an independent body and favor and endorse Government control instead of protecting the people from Government. The latest appeal ruling by Justice Tetley overturning my acquittal from Justice Kowarsky has convinced me that I have to take a very drastic step of a personal sacrifice. A step I have taken already 5 years ago when our farm was raided by 25 armed officers because of raw milk. My repeated attempts to engage authorities in a constructive dialogue have failed on every level. I have only encountered brick walls. This is not about milk, this is about a turning point in regards to individual rights. This is a turning point because we the farmers, we the consumers, we as concerned people of Canada are officially rejecting those who pass regulations without respecting our fundamental rights, our fundamental freedom to be and act as responsible individuals. We openly challenge and reject those who blindly enforce unjust laws. We reject those elected members of Parliament who once promised everything and now refuse to listen and act. We reject the assault on small farmers under the pretence of food safety threats. We reject Government protection in regards to our individual food choices and our individual health treatment choices. We reject the criminalization of those who make informed decisions. Raw milk has become the focal point in the Food Rights Battle across North Amerika. Raw milk will be the breaking point in the Food Rights Battle. Raw milk is being used to spread fears and lies across Canada. Raw milk is wrongly and intentionally targeted, yet the real danger of today’s food lies in the industrialized food system, which is sanctioned and supported by the bureaucracy and Government. We have been battling the raw milk issue now for over 17 years. We have offered the Government more than once our cooperation to explore the legalization of raw milk. New hope arose for many after last years court ruling in Ontario, which recognized the right of educated and informed private individuals to opt out of the apparent responsibility of Government protection. Across Canada Provincial Health agencies are cracking down on cow share operations. challenge our bureaucrats and put our elected officials to task. I will be wherever there is help needed. I will keep challenging unjust laws. I will not rest until we have discovered once again our power to resist, to challenge and to stand on guard for Canada and it’s fundamental values of true freedom and responsibility. I do not want to be asked by my grandchildren; why did you not prevent this dictatorship of thoughtless bureaucrats when you still could? Our greatest enemy today is not from another country it is from within our country. This enemy is mostly invisible for many and therefore dangerous and deceiving. As wisely expressed by Goethe: “No man is more hopelessly enslaved, than he, who falsely believes that he is free”. Let’s have the courage to see and face the real enemy within. Let’s recognize our strength and our will to battle those who are the real enemies. Let’s understand that the greatest fear for bureaucrats and Governments are those who have no fear. Ontario, Alberta, British Columbia have been involved in court actions against farmers and cow share members without any respect for the individuals rights and often without due legal process. As a result of the recent legal developments in British Columbia and Ontario I will once again enter into a hunger-strike as of today, to activate and encourage more and more people to openly join this battle for our fundamental rights and freedom to choose our food and our health. It is up to us to change the current destruction of our rights. We cannot wait until our elected officials finally understand that they are serving us. It’s perhaps significant that all this is coming to a head at Michaelmas. I affirm everything that Michael says here. I am 55 years old and I have farmed here (Minnesota) since 1980. I have seen nothing but continual, constant erosion of community values, the destruction of local economies which produce fairness and tolerance, thrift and ingenuity; and I have steadily observed the loss of land ethics (stewardship) and family structure–families break up or are made chaotically disjointed through forced, excessive labor demands (work, work, work) because of horrific low wages and high costs of ‘living’. This has to stop and the bureaucrats and the technocrats and their armies doing this must be destroyed. Or else we all die. Michael, I’m not sure what a hunger strike will do. But for what it’s worth, from little ole Alberta I will join that hunger strike! It’s 6AM Sept 30th, I’m with you. 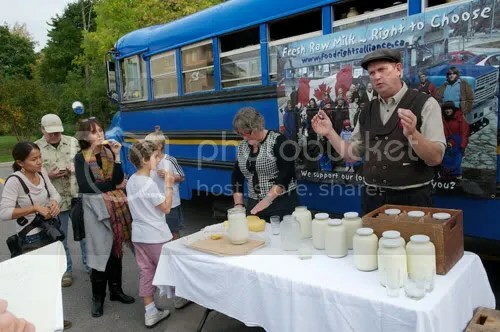 Come on Canada, Come on Small Farmers, Come on Raw Milk customers, and the like ….. lets join the hunger strike and show solidarity, as well as showing the government that we won’t go away quietly! It is time we stopped asking for our rights and starting TAKING them back! I hope his hunger strike exclude raw milk. Be careful Micheal we need men like you. I find it confusing that the supreme court of Canada can legalize a safe injection site for ilegal narcotics in Vancover base on the rights of the drug users, yet we cannot consume raw milk and have no right to do so. Can someone explain? What if I developed an addiction to raw milk? Would I be granted the same? Attention needs to be brought to this issue. The real question now is how do we do this. Please take care….you are needed now more than ever.